— He was active in the southern Netherlands at the time when demand was high for decorative schemes embodying the tenets of the Counter-Reformation: altarpieces and other religious paintings form the largest part of his considerable oeuvre. To a significant extent he owes his reputation to the fact that he was one of the earliest and most consistent followers of Rubens, whose formal idiom he disseminated beyond Antwerp’s artistic circles. — Gerard Seghers was a student of de Crayer. 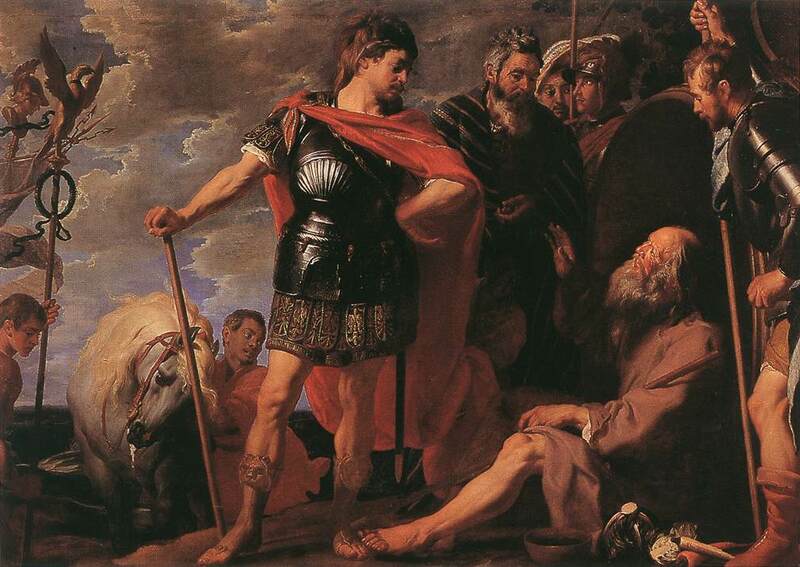  Alexander and Diogenes (196x278cm; 715x1008pix) _ The meeting between the classical ruler Alexander the Great and the philosopher Diogenes had been illustrated in the 15th and 16th centuries but was also a popular subject in Italian and Netherlands Baroque painting. Diogenes replied to Alexander, the conqueror of the world, when he asked him if he wanted anything: "Stand a little less between me and the sun." The contrast between the youthful and beautiful hero and the beggarly old man whose life exemplified asceticism is exploited in the composition and use of colors. The message of the painting is the meaninglessness of earthly power when confronted with ethical principles. The Antwerp artist de Crayer later became court painter to the archduke in Brussels. This work, reflecting his dealing with forms and themes in the work of Rubens, is one of his best. 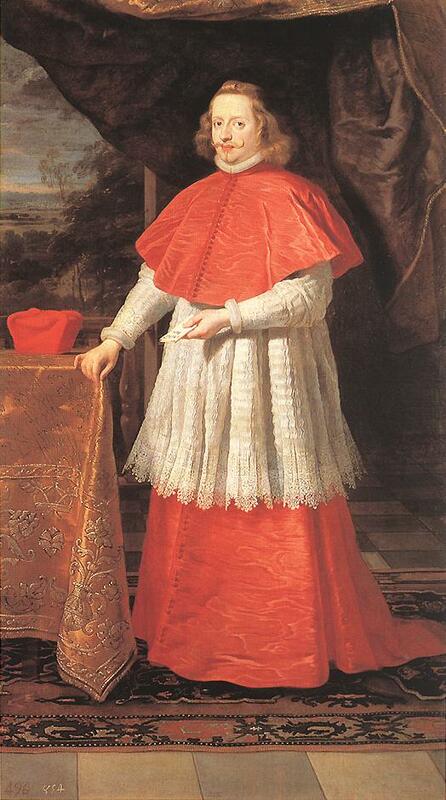  The Cardinal Infante (1639, 219x125cm) _ Crayer was a student and continuator of Rubens, also influenced by Van Dyck. He was the accredited painter for the churches of Brabant and Ghent. 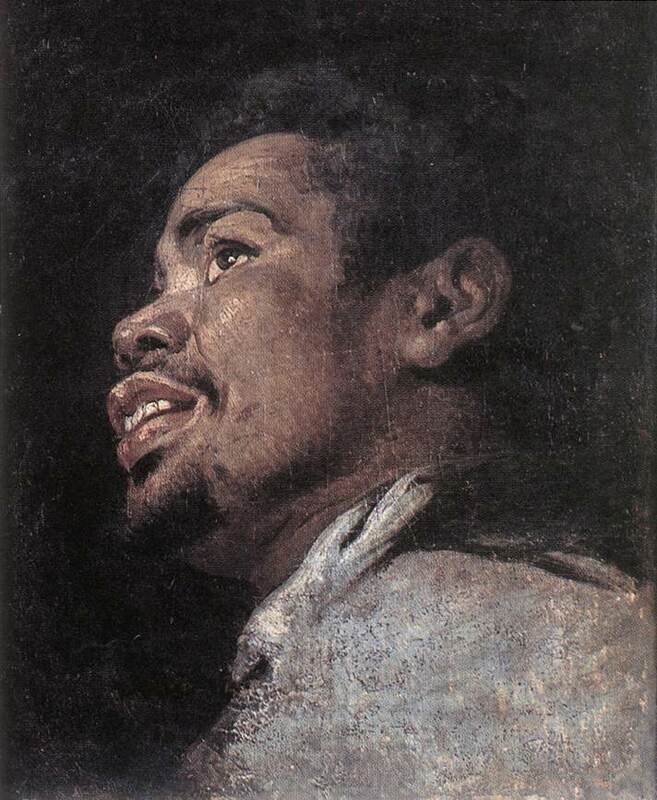  Head Study of a Young Moor (40x33cm) _ Rubens' style was imitated by many 17th-century artists, who devoted themselves to large-scale ecclesiastical commissions. Gaspar de Crayer, a Brussels master who settled in Ghent in 1664, was one of the most talented members of this group. A series of his paintings can be seen in local churches. De Crayer's best work is marked by the grandeur of its composition. Although he lacked Rubens' drive, he made up for it somewhat with his refined modeling and soft palette, and never descended into the tedium of most Rubens imitators. ^ Died on 18 November 1976: Emmanuel Rudnitsky “Man Ray”, US Dadaist and Surrealist photographer, painter, and filmmaker, born on 27 August 1890. — He was was born in Philadelphia, and moved to New York with his family seven years later. In New York he frequented Alfred Stieglitz’s gallery “291” in 1911 and attended classes at the Ferrer Center in 1912. In 1915 his first solo show was held at the Daniel Gallery, New York. About this time he took up photography, the medium for which he was to become best known. He entered into a lifelong friendship with Marcel Duchamp, with whom he and Walter Arensberg founded the Society of Independent Artists in 1916. With Duchamp, Katherine Dreier, Henry Hudson, and Andrew McLaren, Man Ray established the Société Anonyme, which he named, in 1920. Man Ray moved from New York to Paris in 1921. In Paris Man Ray was given a solo exhibition at the Librairie Six in 1921. His first Rayographs (photographic images produced without a camera) were published in Les Champs délicieux, rayographies in 1922, the year in which Man Ray participated in the Salon Dada at the Galerie Montaigne in Paris. With Jean Arp, Giorgio de Chirico, Max Ernst, André Masson, Joan Miró, and Pablo Picasso, he was represented in the first Surrealist exhibition at the Galerie Pierre in Paris in 1925. From 1923 to 1929 he made the films Le Retour à la raison, Emak Bakia, L’Étoile de mer, and Les Mystères du château de dé. In 1932 Man Ray’s work was included in Dada, 1916–1932 at the Galerie de l’Institut in Paris and in a Surrealist show at the Julien Levy Gallery in New York. He collaborated with Paul Eluard on the books Facile in 1935 and Les Mains libres in 1937. In 1936 he went to New York on the occasion of the Fantastic Art, Dada, Surrealism exhibition at the Museum of Modern Art, in which his work appeared. Man Ray left France in 1940, shortly before the German occupation, making his way to Hollywood and then to New York. In 1951 he returned to Paris, where he was given a solo show at the Galerie Berggruen. In 1959 a solo exhibition of Man Ray’s work was held at the Institute of Contemporary Art in London. His autobiography Self Portrait was published in 1963. Ten years later the Metropolitan Museum of Art in New York presented 125 of his photographic works. Man Ray died in Paris. — Portrait of Man Ray by Edward R. Shaw. — Pisces aka La Femme et son Poisson (1938, 60x73cm) _ This was based on a suite of drawings that Man Ray published, with poems by Paul Eluard, as Free Hands in 1937. ‘In these drawings my hands are dreaming’, he later remarked. The woman lies alongside a fish to create what the artist described as ‘a contrasting of similar and different forms at the same time’. Man Ray strengthened the identification of woman and fish by choosing Pisces as the English title, the zodiac sign of paired fishes. — Silhouette (1916, 52x64cm; 451x573pix, 137kb) _ In 1915 Man Ray abandoned what he called his “Romantic-Expressionist-Cubist” style and adopted a mechanistic, graphic, flattened idiom like that developed by Francis Picabia and Marcel Duchamp during the same period. This drawing is preparatory to his most successful painting in this style, The Rope Dancer Accompanies Herself with Her Shadows (1916), the subject of which was inspired by a vaudeville dancer whose movement he wished to suggest in a series of varying poses. Man Ray’s interest in frozen sequential movement may derive from the experiments in photography he initiated about this time. The particularized features of the figures in this drawing are eliminated to produce two-dimensional patterned forms that are silhouetted against black oval shadows. The dancer is accompanied not only by her shadow but also by music, concisely indicated by the voluted head of an instrument at the lower right of the support, the strings across the bottom, and the music stand at left. The position of her feet on the strings, which may double as a stave, may be meant to convey a specific sequence of notes, as if the dancer were indeed accompanying herself musically. It seems likely that this drawing represents the first stage in the conception of the painting. In the canvas the three positions of the dancer are superimposed and appear at the top of the composition, with the greater part of the field occupied by her distorted, enlarged, and vividly colored cutout shadows. ^ Born on 18 November 1573: Ambrosius Bosschaert I, Flemish Baroque flower and still-life painter, active mainly in the Netherlands, who died in 1621.  Ambrosius Bosschaert I is recorded in Middelburg from 1593 to 1613 and later in the Utrecht Guild in 1616. Although he spent the major part of his life in the Netherlands, Bosschaert's style was basically Flemish - similar to that of Jan Brueghel, with whom he ranks in quality and as one of the pioneers of flower painting as an independent genre. His bouquets have a rich variety of flowers from different seasons arranged in a formal way. The degree of finish and exactitude, and the subtlety of the color, are exceptional. 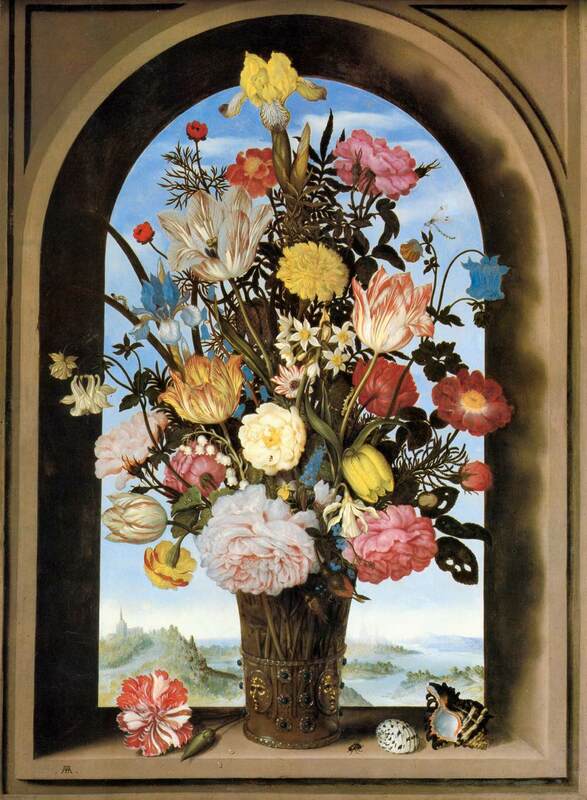 His Vase of Flowers (1620) is one of the most reproduced of all flower pieces. Bosschaert may fairly be said to have initiated the Dutch tradition of flower painting and his style was continued by his three sons, Ambrosius Bosschaert the Younger [1609-1645], Abraham Bosschaert [1613-1643], and Johannes Bosschaert [1610-1650], and also by his brother-in-law, Balthasar van der Ast. — Ambrosius Bosschaert I is a representative of 17th century Dutch still life, he was one of the first painters who concentrated entirely on still lifes with bouquets of flowers and fruit. Bosschaert was born in Antwerp in 1573, but had to flee to Holland because of his religious beliefs before reaching the age of twenty. He settled in Middelburg, the capital of the Dutch province of Zeeland, where he became famous for his radially composed still lifes of flowers. Later he also worked in Utrecht and Breda. The most famous of his works is no doubt his Bouquet of Flowers, placed in front of a round, arched window. It has been observed that Bosschaert’s still lifes, combine flowers that blossom at different times, so that this is an idealized flower still life, a painted botanical encyclopedia to a contemporary viewer, at the same time his floral paintings have a symbolic meaning, which is true for all early masters of the still lifes, even though the symbols are often hidden from contemporary eyes. As a floral still life painter Bosschaert started a whole ‘dynasty’ that specialized in the subject, and the tradition he had started was continued by his three sons, two brothers-in-law and a son in law. He also worked as an art dealer. Bosschaert died in The Hague. He had a great deal of influence on Dutch still-life painting.  Bouquet of Flowers (1620, 23x17cm; 1001x789pix) _ Analysis of the flower pieces made by Bosschaert and other flower painters of his time reveals that their bouquets were seldom painted from life. They were assembled from a number of independent studies which serve as patterns. The pictures frequently show blossoms which bloom at different seasons of the year, and it is not unusual to find the same flower, shell, or insect in more than one picture. This manner of composing flower pieces was continued by later artists.  Bouquet in an Arched Window (1620) _ One of the oldest types of still-life is the flower piece. It seems that flower painting was established as an independent category in the Netherlands during the third quarter of the sixteenth century, with the rise of a widespread interest in gardening and the cultivation of exotic flowers. The principal member of the group of flower painters during the first decades of the seventeenth century was Ambrosius Bosschaert the Elder, the founder of a dynasty of flower and fruit painters. His prime work is the brilliantly colored Bouquet in an Arched Window. 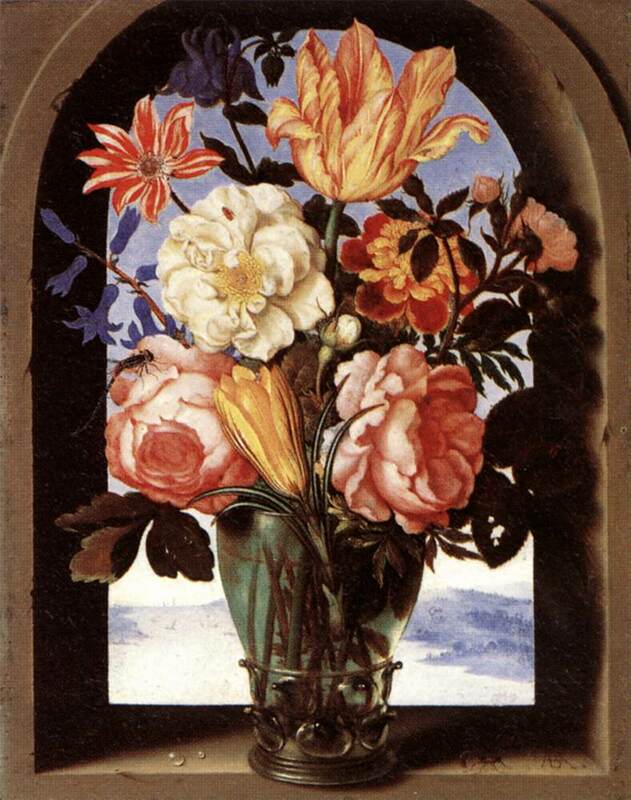 Jacob de Gheyn II and Roelandt Savery painted similar multicolored bouquets in niches, but only Bosschaert showed flowers against an open vista. The painting's exquisite attention to detail recalls works by miniaturists. Of Baroque chiaroscuro there is not a trace. Each bloom in his typically axial symmetrical arrangement is given equal attention and is minutely analyzed in an even light. Analysis of the flower pieces made by Bosschaert and other flower painters of his time reveals that their bouquets were seldom painted from life. They were assembled from a number of independent studies which serve as patterns. The pictures frequently show blossoms which bloom at different seasons of the year, and it is not unusual to find the same flower, shell, or insect in more than one picture. This manner of composing flower pieces was continued by later artists. Moreover, the huge bouquets are usually far too large for the roemers or vases that hold them. If set up in the studio they would surely topple over. ^ Buried on 18 November 1630: Esaias van de Velde, Dutch painter, draftsman, and etcher, specialized in landscapes, baptized as an infant on 17 May 1587. — He was the second son of Cathalyne van Schorle and the painter and art dealer Hans van den Velde [1552–1609], a Protestant who fled religious persecution in Antwerp and settled in Amsterdam in 1585. Esaias van de Velde probably received his earliest training from his father. It is also possible that he studied under the Antwerp painter Gillis van Coninxloo, who moved to Amsterdam in 1595 (ten years after Esaias’s father). He may also have been trained by David Vinckboons, whose work shows similarities with that of Esaias. On his father’s death, Esaias moved to Haarlem with his mother, and the same year he married Katelyna Maertens, with whom he had four children: Jan [1614–], Esaias the younger [1615–], Anthonie the younger [1617–1672] and a daughter, Jacquemijntgen [1621–]. Both Esaias the younger and Anthonie the younger became artists, the latter a still-life painter named after his uncle, the Antwerp painter Anthonie van den Velde the elder [1557–]. Esaias’s older brother, Jan van de Velde I [1568–1623], was a famous calligrapher, who moved from Antwerp to Rotterdam after his marriage in 1592. His eldest son, Jan van de Velde II [1593 – Nov 1641], was a painter, draftsman and printmaker, like his uncle. He had a son, Jan van de Velde III [1620–1662], who became a still-life painter. Both Esaias I and Jan II played an important role in the development of naturalistic Dutch landscapes in the 17th century. Esaias I became a member of the Haarlem Guild of Saint Luke in 1612, the same year as Willem Buytewech and the landscape painter Hercules Segers. During this Haarlem period Esaias had two students, Jan van Goyen and Pieter de Neijn [1597–1639], but by 1618 he had moved with his family to The Hague, where he joined the Guild of Saint Luke in October of that year.  Van de Velde painted genre and battle pictures, but is best known for his realistic landscapes, by which he helped establish the Dutch school of realistic landscape painting. His use of composition and color in works such as Dune Landscape (1629) were especially influential. He worked in Haarlem from 1610 to 1618 and then in The Hague where he was Court Painter to the Prince Maurits and Frederick Hendrick, until his death. Jan van Goyen was his student. There were other artists in his family, but he was not related to the family of Willem van de Velde, who were marine painters and landscapists including Willem van de Velde the Elder [1611 – Dec 1693], his son Willem van de Velde the Younger [1633 – 06 Apr 1707], Adriaen van de Velde [1636-1672] brother of Willem the Younger.  The Cattle Ferry (1622, 75x113cm; 879x1600pix, 222kb) _ A hive of activity along the water, it couldn't be more Dutch. A full ferry crosses the river in the foreground. On the left bank is a tavern, with a pigeon loft on the roof. To the right, people are waiting for the ferry near the jetty while another group work on a boat. In the distance are a mill and a church. The Cattle Ferry constitutes an important stage in the development of the landscape genre. This was the first time that a typically Dutch river landscape was depicted on a large scale. Looking closer, several interesting details catch the eye, the empty ferry, for example, and its almost smooth reflection in the water. Van de Velde's manner of painting figures is also remarkable. They often resemble rather plump dolls, with clear black contours. Like other landscape artists, Van de Velde made sketches in the countryside. Later, he would merge these sketches into new, painted compositions. Two of these drawings show elements which are found in this painting. The ferry and the church spire in the Cattle Ferry are from one sketch, while the house on the right is the mirror image of the house in the other drawing. Here the horizon is halfway down the painting. But for centuries this was not the case. About 1650 an extra section was added to the panel raising the top of the picture by 14 cm, with a bluer sky above the clouds. This was presumably intended to adapt the painting to the fashion of the day. In the mid-seventeenth century, landscapes with a low horizon and a profusion of (cloudy) sky were in vogue. It was only in the early 1990s that the painting was restored to its original proportions. Not by removing the additional piece, but by concealing it in a new frame. The eye zigzags from one bank to the other. The glistening water contrasts sharply with the darker waterside. A rather unrealistic shadow is cast over the foreground that, together with the ferry and the tree on the left, form a repoussoir enhancing the sense of depth. This coulisse-like composition and the high horizon suggest that the painting was based on Flemish examples. Esaias van de Velde had probably been taught by the Flemish landscape painter Gilles van Coninxloo. However, for his Cattle Ferry he did not take as his example the latter's fantasy landscapes, but rather the typically Dutch river landscape.  Ferry Boat (1622, 76x113cm; 707x1080pix) _ Between 1607 and 1640, entrepreneurs and engineers drained vast lakes in the province of Holland, thus creating acres of new arable land. New villages sprung up in these low-lying "polders," protected only by dikes and pumps, driven by the readily available wind power of the flat countryside. At the same time, entrepreneurs created an efficient system of transportation along rivers and canals, as this painting attests.  Winter Landscape (1623, 26x30cm) _ In 1612 two landscape artists, Hercules Seghers and Esaias van de Velde joined the painters' guild in Haarlem, and it is from that year that the origins of realistic landscape painting in the north Netherlands can be dated. Esaias was born in Amsterdam in about 1590 and probably trained in the studio of Gillis van Coninxloo, an Antwerp landscape painter and follower of Pieter Bruegel the Elder; who had fled to the north as a Protestant refugee from the war in Flanders. Esaias van de Velde developed Coninxloo's style in the direction of greater realism. As can be seen in this small panel of 1623, his mature style is characterized by a striking naturalism created by free brushwork and a deliberately restricted palette. The mannerisms of Flemish landscape have disappeared to leave an image which conveys all the crispness of an icy winter day in Holland. The figures are sketched in sure, quick strokes, the landscape evoked in pigments thinly scraped across the still-visible gesso ground. Van de Velde also studied the work of Adam Elsheimer, the German painter who moved to Rome in the first decade of the seventeenth century. Esaias would have known Elsheimer's paintings in the form of prints and it is from them that he derives his low viewpoint and the triangular composition. At the same time as the powerful and naturalistic landscapes of Seghers and Esaias van de Velde were being created in Haarlem, Esaias's cousin, Jan van de Velde, was at work in the town engraving his delicate landscapes, and Cornelis Vroom was creating his understated but remarkably innovative paintings and prints based on the countryside around the town. Among Esaias's students was Jan van Goyen who was further to develop and refine his master's style.  View of Zierikzee (1618, 27x40cm) _ In this landscape a great natural effect is achieved by the artist. There is the outline of the town, occupying almost all the horizon, in a not too distant view, and painted almost exclusively in dark tones of brown, as one might see the silhouette of a town in the failing light of dusk, with only a few patches of very dark green in the river bank. The sky is a liquid blue, with stray clouds which by their diagonal sweep define and emphasize the sky's width. The sky and the town are reflected in the calm water. In the foreground is the near bank with fishermen. Their silhouettes, and the strong red color worn by the middle one, are points against which the vast space beyond may be measured. The surprise of this brilliant painting lies in Esaias's total matter-of-factness. All chances to embellish the picture, to make it more attractive to contemporary Late Mannerist taste, have been passed by. The painting is deliberately dry, almost to the point of fanaticism, and that is why it contains, already at this early date, the complete program of realist landscape: the low viewpoint, the wide space, the horizon, the sky, the little figures as spatial points of reference.  Landscape with Trees (1619 etching, 17x18cm) _ In a woodland landscape with a lake, a house lies hidden behind the trees. A shepherd with his flock, a horseman and two people on foot are approaching at the bend in the road. Esaias van de Velde focused particularly on decorative elements in this etching, with its remarkable nearly square format. The trees are set against the sky with their sinuous branches and fan-shaped foliage. Van de Velde cropped the tree in the foreground at the top of the plate and by using different types of hatching he introduced variation into the depiction. The road is built up with simple, equidistant lines (a method borrowed from engraving. For the woodland in the background Van de Velde used short strokes and dots, while the tree on the right has regular undulating lines. The wooded landscape depicted here is probably a fantasy. In fact Van de Velde made his name as one of the artists in Haarlem who followed the example of Hendrick Goltzius with realistic drawings of the surrounding countryside. Another of these pioneer artists was Willem Buytewech. About 1615-1616 Van de Velde created a series of etchings featuring landscapes sketched around Haarlem. The Rijksmuseum collection contains this etching of an execution ground and a drawing made in preparation for the series. Because they were distributed as prints, Van de Velde's drawings became enormously influential in the art world. Through his student, Jan van Goyen, Dutch landscape art acquired a new autonomy; figures vanished almost completely from the landscape.  Landscape with Gallows, near Haarlem (1616 etching, 9x17cm) _ About 1615-1616 Esaias van de Velde etched a series of ten prints from sketches he had drawn in the countryside surrounding Haarlem. This etching shows the dune landscape of the region. The artist has managed to convey the sense of spaciousness in the small print. A meandering path draws the eye past the ploughed fields and the gallows, on into the distance. With dots and dashes Van de Velde created a rarified atmosphere. There are no half tones, only the contrasting black and white, giving the landscape a remarkable clarity. A rather gruesome detail in this landscape is the corpse dangling from the gallows. Alongside stands the wheel on which the condemned were broken in a lingering death. Execution grounds like this were always located at a distance from the city. Esaias van de Velde included an inscription on the plate stating that E. V. VELDE had made the picture (fecit) and that P. Beerendrecht had made the etching (excudit).  Spaarnwoude (1615 drawing, 9x18cm) _ This is one of several drawings sketched by Esaias van de Velde in preparation for a series of etchings of landscapes of the countryside around Haarlem. Sets of landscape etchings like this were common in the years 1610-1620. In the drawing, the artist has presented a view of Spaarnwoude village, near Van de Velde's home town of Haarlem. Slightly left of center is the slender church tower, a little crooked and rendered with an apparently rushed hand. The church at Spaarnwoude had been destroyed in 1572, during the Dutch Revolt. Although the tower survived, the aisles had still to be rebuilt when Van de Velde made this sketch in Spaarnwoude. This drawing was a preparatory sketch for a series of landscape etchings. The etching of Haarlem's execution ground [above] is part of the same series. In both landscapes the figures bring the scene to life. In the drawing, people are walking towards the village and cattle are grazing in the meadow. The etching features a hawker and a hanged man swinging from the gallows. Alongside Willem Buytewech, Van de Velde was one of the pioneers of realistic depictions of the Dutch landscape. Nevertheless, the narrative elements in his pictures betray his roots in the Flemish landscape tradition. ^ Born on 18 November 1882: Percy Wyndham Lewis, Canadian British writer and painter, born on a yatch near Amherst, Nova Scotia. He died on 07 March 1957 in London.  Lewis founded the abstract Vorticist movement, which, in painting and literature before WW I, sought to relate art to the industrial process. (Tarr, Apes of God). Lewis went to England and was educated at Rugby School and the Slade School of Art (1898-1901). After leaving art college Lewis spent the next seven years in Europe. When he returned to England in 1909 he began publishing stories, essays, novels and plays. In 1912 Lewis became the founder of Vorticism, a literary and artistic movement. Members of the group included Charles Nevinson, Henri Gaudier-Brzeska, William Roberts and Alvin Langdon Coburn. In his journal, Blast (1914-1915), Lewis attacked the sentimentality of 19th century art and emphasized the value of violence, energy and the machine. In the visual arts Vorticism was expressed in abstract compositions of bold lines, sharp angles and planes. From 1916 to 1918 Lewis served on the Western Front as a battery officer. He was also commissioned by Lord Beaverbrook and the Canadian War Memorials Fund to paint A Canadian Gun Pit. However, his most famous war painting is A Battery Shelled. Lewis later wrote an account of his experiences in the war entitled, Blasting and Bombardiering (1937). After the First World War Lewis developed right-wing views and was sympathetic to the political changes taking place in Germany and Italy. On the outbreak of the Second World War returned to Canada. In 1951 Lewis went blind and was forced to give up painting. In his later years he concentrated on writing, this included the autobiographical Self-Condemned (1954) and The Human Age (1955). Percy Wyndham Lewis died in 1957. — Portrait of Wyndham Lewis (1955,: 80x100cm; 408x512pix, 19kb) by Michael Ayrton [20 Feb 1921 – 16 Nov 1975].  A Canadian Gun-Pit (1918, 305x362cm) _ A Battery Shelled (1918, 183x318cm)  Despite the difference in format and the - less obvious - difference in style, these two works may be considered as being two moments from the same story. Through his training, Wyndham Lewis (1882-1957) belonged to the Vorticists, the London branch of the Cubo-Futurists. Along with the poet Ezra Pound, he edited the magazine Blast and stood out as a leader of that movement, if only because of his provocative stances and his taste for controversy. In March 1916, he signed up in the artillery. In May 1917, he met Orpen and, paradoxically modeling his style on this painter whose art he considered outmoded, he in turn became "official army painter" with the Canadian and later British troops. This took him to the Vimy sector, before he transcribed his observations onto monumental formats. A Canadian Gun-Pit and A Battery shelled are examples of this original enterprise - at the risk of disconcerting, Lewis combined the geometrical stylization of Vorticism and more immediately figurative elements, close to the portrait for instance. The former offers a wealth of detail, with the sheet metal of the dugouts, the mechanisms of the gun, the uniforms and camouflage nets. The latter is more elliptical; a group on the left observes impassively the devastation caused by the bombing as a dead gunner is buried by his comrades. More deliberately modernist in tone, it is based on a plastic language of angles, lines, changes of scale and schematization of silhouettes. These paintings are thus the product of one of the rare attempts at inventing a modern style of war painting._ Wyndham Lewis endeavors to show the war in terms of energy - Battery Shelled - in which the symbolism dominates, in which men lose their human form in action; chimneys wave and bend, and the very shells zigzag in lumps and masses across the sky. ^ Born on 18 November 1907: Yves Brayer, French painter who died in 1990. — Son oeuvre s'avère très diverse, car outre ses paysages, il a peint de grandes toiles de compositions, des figures, des natures mortes et il s'est intéressé à toutes les techniques mises à la disposition d'un artiste fertile. Amateur de paysages méditerranéens, il séjourna au Maroc, en Espagne et en Italie, puis se fixa en Camargue et en Provence. Attiré par les paysages méditerranéens, Yves Brayer est séduit par les paysages de la Provence. Ses premières toiles provençales datent de 1945, lors d'un séjour à Saint Rémy de Provence. Il peint les Alpilles et ses oliviers. Circulant à bicyclette, moyen propice à la flânerie, il arrive par hasard au site des Baux de Provence qu'il avait visité en1917 lorqu'il était enfant accompagné de sa mère. Depuis, les escapades en Provence se multiplient. Ses courts séjours l'amènent en Camargue aussi. Il fait construire des cabanes gardianes près des Saintes Maries de la Mer. Le cheval devient un personnage clé de ses peintures et de sa vie. Enfin, la tauromachie qu'il découvre dans sa jeunesse est présente dans son oeuvre. Selon son désir, il est enterré aux Baux de Provence, où un musée lui est entièrement consacré. — Yves Brayer fit partie des peintres qui, entre les deux guerres mondiales, éprouvèrent la nécessité de s'attacher à la réalité qui les entourait. Ceux-ci rejetant, sans pour autant les ignorer, les mouvements picturaux de la fin du 19ème et du début du 20ème siècles, se voulaient davantage les disciples de Vuillard et de Bonnard, tel le groupe de la Réalité Poétique, ou admirateurs de Courbet, tel le mouvement Forces Nouvelles. Si Brayer resta toujours indépendant, il comptait parmi ses amis Francis Gruber qui fut à l'origine du Nouveau Réalisme français des années 1950, et dont Bernard Buffet allait être le brillant exemple. Yves Brayer est né à Versailles, mais la plus grande partie de son enfance se déroule à Bourges. A son arrivée à Paris en 1924, il prend le chemin des académies de Montparnasse, puis celui de l'Ecole des Beaux-Arts. Très jeune, il témoigne de sa personnalité et, des aînés comme Jean-Louis Forain, l'encouragent. Encore étudiant, il expose au Salon d'Automne et au Salon des Indépendants. En 1927 une bourse de voyage de l'Etat lui permet de partir en Espagne où la rencontre avec les maîtres du musée du Prado aura une influence décisive sur son œuvre future. Après un séjour au Maroc grâce à un prix créé par le Maréchal Lyautey, il décroche le Grand Prix de Rome en 1930. Tout d'abord il regrette l'Espagne, puis il se laisse emporter par la richesse de la vie italienne des années trente. A son retour à Paris en 1934, il réunit sa moisson en une grande exposition à la Galerie Charpentier, faubourg Saint-Honoré, où le public découvre l'authenticité de ce peintre de vingt-sept ans au tempérament puissant et original. Paris demeure son port d'attache, et, après avoir vécu dans le quartier du Panthéon, il s'installe, dès 1935, rue Monsieur le Prince, dans le sixième arrondissement. A diverses périodes, il peint dans Paris, alors même qu'il est étudiant, dans les années 1926 à 1929. Démobilisé à Montauban, il s'installe à Cordes sur Ciel dans le Tarn en 1940. Un musée lui sera consacré dans la plus belle salle de la mairie dès 1960. En 1942, il regagne la capitale où Jacques Rouché le charge d'imaginer ses premières maquettes de décors et costumes pour un ballet à l'Opéra de Paris. Il y demeure durant l'occupation et peint la ville enneigée, puis la ville libérée. L'année 1945 marque une nouvelle étape dans son œuvre. En Provence, il réalise qu'il existe d'autres harmonies que celles des architectures créées par l'homme, celles de la nature pure et sauvage et il est bientôt fasciné par la diversité des Alpilles et leurs plissements calcaires, puis par les étendues de la Camargue peuplées de chevaux blancs et de taureaux noirs. Il se fixe bientôt en Provence plusieurs mois chaque année. Après sa période noire espagnole, puis ocre et rouge italienne, il diversifie sa palette en introduisant des verts, des jaunes pâles et quelques bleus. Fortement attiré par les paysages méditerranéens, il retourne travailler en Espagne et en Italie, mais la Provence et la Camargue resteront ses lieux de prédilection jusqu'à la fin de sa vie. Il entreprend divers voyages au Mexique, en Egypte, en Iran, en Grèce, en Russie, aux Etats-Unis et au Japon. S'emparant vite de la lumière et des rythmes de ces pays, il en rapporte de nombreux dessins et aquarelles. Yves Brayer est aussi l'auteur de décorations murales, de cartons de tapisseries, de maquettes de décors et de costumes pour le Théatre-Français, et les Opéras de Paris, Amsterdam, Nice, Lyon, Toulouse, Bordeaux ou Avignon. Ses expositions particulières ont rendu ses œuvres familières dans de nombreux pays : à Paris tout d'abord, puis en France, en Europe et aux Etats-Unis. La bibliothèque Nationale présente en 1977 "Yves Brayer, Graveur" pour son soixante-dixième anniversaire, et le Musée Postal lui consacre une exposition de ses œuvres lors de la parution du timbre qui lui est demandé en 1978. Enfin le Musée Yves Brayer est inauguré en Septembre 1991 aux Baux de Provence. Il est présent dans divers musées et dans de nombreuses collections tant en France qu'à l'étranger. Il fut professeur à l'académie de la Grande Chaumière pendant cinquante ans, Président du Salon d'Automne pendant cinq ans et, au titre de membre de l'Académie des Beaux-Arts, conservateur du Musée Marmottan à Paris pendant plus de onze ans. — Les Rochers de Camaret (1929, 81x102cm; 400x500pix, 57kb) _ En 1929, Yves Brayer passe l'été à Camaret. Il est alors élève à l'école des Beaux-Arts de Paris, dans l'atelier de Lucien Simon et il vient rendre visite à son maître en Bretagne. Brayer campa quelque temps dans les rochers de la pointe de Pen-Hir qu'il représente sur ce tableau. ^ Born on 18 November 1904: Jean-Paul Lemieux, Québec Canadian painter who died on 07 December 1990. — He lived as a child in Quebec but moved with his family to Montreal in 1917 after a year in California. From 1926 to 1929 he studied art in Montreal at the College Mont-Saint-Louis and the École des Beaux-Arts, after which he spent a year in Paris, where he met Clarence Gagnon, before returning to Montreal to complete his studies at the École des Beaux Arts from 1930 to 1934. He began teaching there in 1934 and from 1935 also at the École de Meuble in Montreal. He began around this time to paint landscapes such as Village (1934), followed soon after by dream-like figure scenes on symbolic and religious themes, such as Lazarus (1941). His early tendency to a geometric and decorative approach led him to an ever greater simplification that was especially noticeable in a mural of the mid-1950s, Medicine in Quebec City (300x550cm), in which a group of figures is displayed in a flattened manner against an architectural background. — Lemieux naît à Québec, où il y passera la majeure partie de sa vie. Il étudie à l'Ecole des Beaux-Arts de Montréal où il obtient son diplôme en 1934. En 1937, Lemieux retourne à Québec et accepte un poste d'enseignant à l'Ecole des Beaux-Arts de Québec, qu'il occupera jusqu'en 1967. Les premières œuvres qu'il produit au cours des années trente et quarante s'apparentent à l'art naïf, où il y dépeint la réalité québécoise de l'époque. Bien qu'il délaissera éventuellement ce style, ces tableaux sont fort bien réussis et laissent miroiter un potentiel indéniable. Au cours des années cinquante, le style de Lemieux se raffine alors qu'il élimine le détail de ses compositions. Après un séjour en Europe et quelques expérimentations avec formes et couleurs, le tout débouche sur des œuvres où les personnages se retrouvent campés dans un espace pictural où le temps semble figé. Il y capture dès lors, temps et espace d'une façon étonnamment efficace. Son tableau Les Ursulines (1951, 61x76 cm; 228x286pix; 13kb) qui image bien ce virage artistique, remporte le Grand Prix de la Province de Québec en 1951. Au cours des années soixante, il réalise de pures splendeurs dans le genre, que l'on considère aujourd'hui comme des classiques de la peinture québécoise. Lemieux parvient comme nul autre, à isoler des scènes typiques de la vie quotidienne dans toute leur magnitude et leur simplicité. La solitude et la mélancolie de ses personnages ne font qu'accentuer l'humanisme profond de son œuvre. Ses œuvres bien que simples à première vue, sont pourtant empreintes d'une lourde complexité de par leur composition dénudée de toute superficialité. En 1984, Postes Canada immortalise son œuvre en émettant pas moins de 12 timbres à partir de ses tableaux. Il est reçu à l'Académie royale du Canada en 1951 et comme académicien en 1966. Plusieurs expositions lui seront consacrées au Québec et à l'étranger (Scandinavie, Russie). Jean Paul Lemieux, l'artiste sobre, l'homme discret et simple, meurt à Québec. ^ >2003 Patricia Broderick [23 Feb 1925–], of cancer, US painter and writer of plays and movie scripts. She had actors as husband, James Broderick [–01 Nov 1982], and son, Matthew Broderick [21 Mar 1962~], who starred in the 1996 film Infinity, which she wrote and produced. >1982 Pedro Mozos Martínez [22 Feb 1915–], Spanish painter. A self-taught artist, he moved to Madrid when he was four, after his father died, and he attended classes at the official schools. His talent was discovered by Julio Mois�s and he was sponsored by Ignacio Zuloaga, who helped him to exhibit for the first time in 1933 at Madrid's Fine Arts Circle, where he would return in 1942 and whose Painting Prize he won in 1975. Thanks to a Conde de Cartagena scholarship from the San Fernando Royal Academy of Fine Arts in 1935 he was able to travel to Italy, France and the then-still-Spanish territory of Morocco, to perfect his drawing, a skill he excelled at and for which he was widely rewarded and acclaimed. One year previously he had participated in the National Fine Arts Exhibition, and he would do so again several times during the forties and fifties, as well as participating in the first Sal�n de los Once (1943), the Venice Biennials of 1954 and 1956 and the Hispano-American Exhibitions of 1951 and 1955. He belonged to the well-known Madrid School, a group of artists who participated in a collective exhibition at the Bucholz gallery in 1946 and who understood art and creativity as the means of expressing their desire for freedom and struggle against the social immobility in Spain at that time. He was one of the most dynamic painters of his era, and had continuous collective and individual exhibitions both in Spain and elsewhere in Europe. He was always striving to learn more, and so resided in Paris and Rome, with a scholarship from the Juan March Foundation in 1958 and 1959, to learn about new artistic movements. His dynamic and enterprising spirit was always active, with commissions such as the murals he painted in the Palencia Provincial Assembly, or his contribution to the 1971 UEE calendar 1971 with the work Con la escopeta al hombro (65x50cm). In Madrid, he did an excellent job of training upcoming artists in his drawing classes at the School of Arts and Crafts, and in colour and composition classes at the School of Applied Arts, as well as holding a tenured position at the Madrid Fine Arts Faculty from 1964. — Javier Serna-Avendaño and Pepe Olaso were among his students. =1689 Jacob van der Ulft, Dutch artist born on 21 December 1627. — The Body of the Dead Christ in the Tomb (1522) two images: the whole picture and a detail. ^ 1901 Sydney Leff, US commercial artist who died on 10 December 2005. Leff was born in Brooklyn and attended a vocational high school for the arts in Manhattan. He was a classmate and lifelong friend was Al Hirschfeld, the theater caricaturist. Leff got into the song business in the early 1920's, after answering an ad for an illustrator placed by the songwriter Sam Coslow, who would later write "My Old Flame." 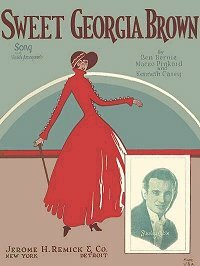 In the 1920's and 30's, Leff designed and drew the covers for the sheet music of nearly 2000 songs, from enduring standards like "Sophisticated Lady," with music by Ellington; "Ain't Misbehavin' " (Fats Waller and Harry Brooks); "Me and My Shadow" (Al Jolson and Dave Dreyer); "Five Foot Two, Eyes of Blue" (Ray Henderson); Berlin's "Blue Skies. ", "Underneath the Harlem Moon," by Mack Gordon and Harry Revel, "Stormy Weather", and "Sweet Georgia Brown" to more ephemeral numbers like "Rock Me in a Cradle of Kalua" and "Baby Feet Go Pitter Patter Across My Floor." Associated in particular with Irving Berlin, Leff also illustrated the work of Harold Arlen, Duke Ellington and many others. . Leff's covers spanned the transition from the dripping tendrils of Art Nouveau to the clean lines and bold tonal contrasts of Deco. Not all of them are memorable; Leff, who earned about $25 a cover, sometimes drew three or four a day. With their promise of romance, glamour and sophistication, Leff's best covers were small graphic dramas, neatly encapsulating the story inside. One of his most enticing images is for "Yes Sir! That's My Baby," by Gus Kahn and Walter Donaldson. On the cover, a fur-swathed young woman, wearing a plumed cloche and an alluringly short hemline, strides toward the viewer. Behind the woman lies a sleepy village, with white houses and a church spire. Was she fleeing her staid home for the lights of the city? Was she a scarlet woman, run out of town? Or had she arrived there to shake things up? Spend a quarter and find out, the cover seemed to say. By the early 1940's, photographs had become the norm on sheet music covers, putting a generation of illustrators out of work. Leff went into advertising, working as an art director at several agencies. ^ 1879 Viggo Thorvald Edvard Weie, Danish painter who died on 09 April 1943. He was self-taught, except for a short period of study under Kristian Zahrtmann [31 Mar 1843 – 22 Jun 1917] at the Kunstnernes Studieskoler, Copenhagen (1906–1907). On his first journey abroad to Italy in 1907 he was impressed by the Mediterranean light, which influenced his later desire to introduce lighter colors into his painting. His maturation as an artist, however, took place in Denmark. His first paintings were naturalistic, with a color scale close to grey. He described this early work as realistic–impressionistic, with a rhythmical weighing out of form and coloring, the chief emphasis being laid on the coloring, as in The Painter’s Mother (1908). In 1912 Weie visited Paris for the first time, and later in the same year he stayed on the island of Christians�. Both of these experiences led to a new stage in his development. The color surface gained a broader and more Cubist character. He began a series of freely-imaginative figurative compositions, in which sea, rocks and figures were woven into a turbulent drama. Among these are different depictions of Poseidon, such as Poseidon Rushing over the Sea Surrounded by Nereids and Tritons (1917), in which the brushstrokes are violent and the color tones restrained. He continued to paint heroic compositions into the 1920s. At the same time he produced paintings lacking in spatial depth, in which the brushstrokes are scarcely evident. The pictures appear to be charged with mystic dreams and nervous impressions. The last 20 years of Weie’s life were characterized by a long series of compositions that show a more intense and free abstraction, together with a continuing experimentation with colours and a lighter and more obvious brush control. He became absorbed in the abstract qualities of colors that were rich and glowing, as in Interior with Figure (1923) and Dante and Virgil after Delacroix (1925). Weie expressed his views on art in his book Poesi og kultur. — Mars og Venus (1923, 122x110cm; 46kb) _ Tre nøgne mennesker danser kædedans i et lyst, blomstrende landskab. Det er et billede på Arkadien, den lykkelige, tabte fortid. Maleriet er kun et fragment af et meget større billede. Oprindeligt sad der i forgrunden til højre en ung mand i skyggen af et træ (man kan stadig se en del af hans arm). Han sad hensunken og uden for fællesskabet. Kunstneren har skåret ham væk, som om han ville insistere på den lyse side af tilværelsen. Edvard Weie var en af de kunstnere, der var med til at udvikle det modernistiske maleri i Danmark, men han følte selv, at han havde modgang og ikke blev forstået. — Livsglæden, tre dansende figurer. Fragment af en større komposition (1911, 75x87cm; 57kb) _ Tre nøgne mennesker danser kædedans i et lyst, blomstrende landskab. Det er et billede på Arkadien, den lykkelige, tabte fortid. Maleriet er kun et fragment af et meget større billede. Oprindeligt sad der i forgrunden til højre en ung mand i skyggen af et træ (man kan stadig se en del af hans arm). Han sad hensunken og uden for fællesskabet. Kunstneren har skåret ham væk, som om han ville insistere på den lyse side af tilværelsen. Edvard Weie var en af de kunstnere, der var med til at udvikle det modernistiske maleri i Danmark, men han følte selv, at han havde modgang og ikke blev forstået. –- Vue de Paris depuis Montmartre (634x838pix, 53kb) Picture of an isolated windmill, with five elegantly dressed persons standing by; very little is seen of Paris, on the distant horizon. 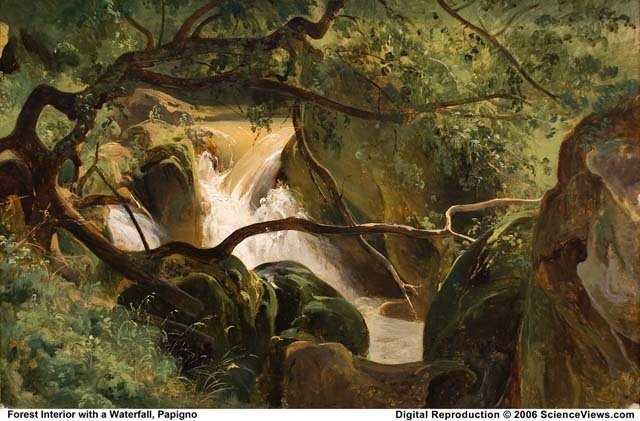 ^ >1858 Luigi Pastega, Italian painter who died on 27 January 1927. –- Le Pettegole (40x55cm; 651x900pix, 129kb) _ Il dipinto documenta una pagina di vita quotidiana della Venezia del XIX secolo. La giovane popolana seduta, al centro della tela, che guarda con curiosità, insieme alle amiche, il passare di una donna ben vestita, avvolta nel suo elegante sial, è una infilatrice di perle: a Venezia e soprattutto nel sestriere di Cannaregio, dove si svolge la scena, si era creato un fiorente indotto delle fabbriche di Murano specializzate nella produzione di perle, che venivano infilate a mano dalle giovani veneziane. Le collane policrome così confezionate dalle impiraresse, erano poi esportate in tutto il mondo. La scena si svolge nella Fondamenta Gasparo Contarini, lungo il Rio de la Madonna de l’Orto, poco lontano dall’omonima chiesa trecentesca. Nei pressi della chiesa si trovava anche un pozzo, dove evidentemente si sta dirigendo, con due secchi di rame, la figura più a destra nel quadro. Sullo sfondo si riconosce il palazzo Mastelli, detto anche “del cammello” per la presenza sulla facciata di un altorilievo raffigurante un uomo che conduce un cammello. Il palazzo fu edificato da una famiglia di mercanti giunti dalla Morea: le statue dei tre fratelli, identificati come Mori, sono collocate lungo il prospetto di Campo de’ Mori, che da loro appunto prende il nome. ^ 1732 Pehr Hillestr�m, Swedish painter and tapestry-weaver who died on 13 August 1816. In 1743-1744 he was apprenticed to the tapestry designer and decorative painter Johan Filip Korn [1728-1796] in Stockholm and at the same time was a student at the Kungliga Akademi för de Fria Konsterna, where he took drawing lessons. In 1744 Christian Fehner, a German fan painter living in Sweden, took him as his apprentice. In 1747 Carl Hårleman apprenticed him to the French high-warp weaver Pierre-Louis Duru [–1753], and for the next ten years he served as Royal Weaver to the Swedish Court. His first large commission was the throne canopy (1746–1753) for the Audience Chamber in the Kungliga Slott in Stockholm. In 1757–1758 he went to Paris to study weaving at the Savonnerie factory but instead he took classes in pastel and oil painting from Boucher [29 Sep 1703 – 30 May 1770] and Chardin [02 Nov 1699 – 06 Dec 1779]. After his return to Sweden he wove parade carpets and did tapestry portraits of Hårleman, and of Gustav III and his sister Princess Sofia Albertina after originals by Boucher, Jean-Baptiste Oudry [17 Mar 1686 – 30 Apr 1755], and Lars Bolander (fl 1774–1795). After 1773 he became more interested in painting than in tapestry-weaving and he made more than 1000 paintings between 1773 and 1810. He was appointed Painter to the Royal Court in 1776 and became a professor at the Akademi the following year. He was a pioneer in the depiction of Swedish folk life. Lovisa Ulrika, Queen of Sweden, commissioned him to paint Haymakers’ Feast at Svartsjö Slott (1782), while for Gustav III [24 Jan 1746 – 29 Mar 1792] he made a series of studies of farmers dressed in different regional costumes and gathered together for celebrations. He also portrayed court life at the royal palaces in Stockholm and Drottningholm (e.g. Conversation at Drottningholm, 1779) in a series of somewhat naive paintings and for Gustav III he painted 21 scenes based on operas and plays. Hilleström was Sweden’s first painter of historical subjects. He did a series of paintings based on the early legends of Ingjald Illråde. In addition, he depicted more recent Swedish history in such portraits as Gustav I (reg 1523–1560) and Adolf Frederick (reg 1751–1771). In his later years he was Principal of the Modellskola of the Akademi and was the Director of the Akademi from 1810 until his death. His son Carl Peter Hilleström [1760–1812] was a landscape painter.